Executive producers Rock Doyle and Trent Maurice Boling present “Talk With Your Mouth Full” – a half hour of amazing food and great conversation. Reality television host Andrew Dan Jumbo welcomes Chef Mark Sciortino from Marco’s Restaurant as he cooks a gourmet meal for Andrew and his guests. You’ll meet some of Buffalo’s most eclectic and influential people discussing the foundation of where our social and emotional state of society rests in our area. See talkwithyourmouthfulltv.com for more information including “Talk With Your Mouth Full – Dinner Social Events” coming to your neighborhood where the celebration of food and conversation becomes interactive. The premiere episode “Survivor Thriver” addresses cancer awareness and cancer survivors everywhere and features guests Susan Morreale and Amy Lesakowski. 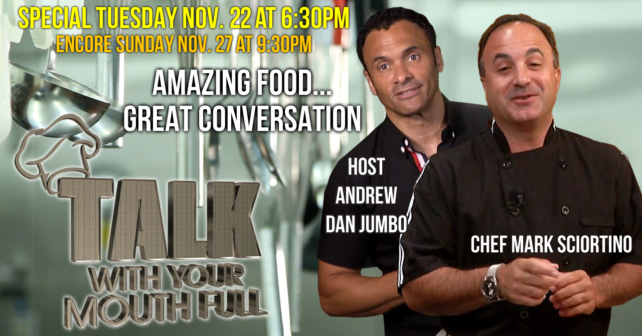 Join us at Acropolis OPA, 708 Elmwood Avenue in Buffalo for the premiere “Talk With Your Mouth Full – Dinner Social Event” (Tuesday, November 22 at 6PM – 7:30PM) see this FaceBook Event Listing for ticket information.